When Ryan Deprey and Todd Albert, well known teachers and coaches in the local school system, heard that one of the longstanding driving schools in Caribou was closing due to retirement, they saw an opportunity. The pair approached Josh Nadeau, Maine SBDC business advisor at Northern Maine Development Commission (NMDC), to take advantage of that opportunity – to start a driving school business. Like many Maine SBDC clients, they first wanted to know if their business idea was going to be feasible. Logically it made sense as Caribou has supported two private driving schools since 1993, when driver’s education was removed from the curriculum of Caribou High School. They wanted to be sure it was financially reasonable for them. Nadeau worked with Deprey and Albert to construct a 12-month cash flow. The clients also needed a loan for working capital to purchase a car, books and other materials in preparation for teaching the driver’s education course. Nadeau also assisted them in the development of a business plan to present to lenders. 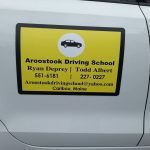 The pair received loans from both NMDC and KeyBank, allowing them to create the new business, Aroostook Driving School. The school will be offering classes throughout the year to both traditional students and adults, and will offer a reduced rate to honor roll students. Follow them on their Facebook page or contact them at 207-551-6181.